The police have responded to a Stomp query and confirmed that a report was lodged after an elderly Jaguar driver was caught on video sideswiping a motorcyclist on the Central Expressway (CTE) on Saturday (Sep 1). A police spokesman told Stomp that they are looking into the matter. In a report on Monday (Sep 3), the Jaguar driver was caught a second time on video hitting the side of a motorcyclist, five months after getting into an argument with another rider whom he sideswiped at Yio Chu Kang Road. 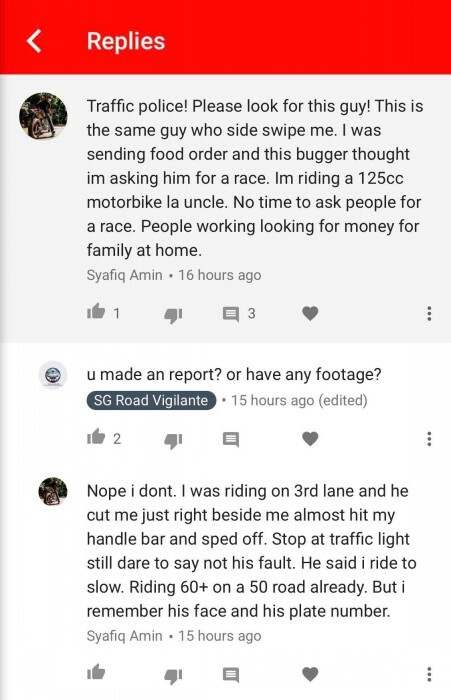 The motorcyclist involved in the latest incident, Mr Abel Kenneth Pereira posted an account of what happened on SG Road Vigilante's Facebook page. He shared a video of the moment the Jaguar with licence plate number SN80U sideswiped him, almost knocking him and his pillion rider off the bike. Fortunately, he managed to regain his balance and increased his speed to catch up to the Jaguar driver whom he confronted in another video. 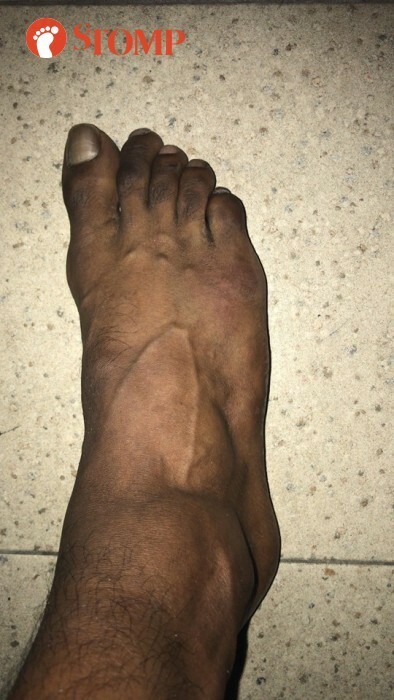 Stomp reached out to Mr Pereira who said that he injured his right foot and knee following the incident with the driver. "My foot is swollen due to the hit from the Jaguar," the operations manager told Stomp. "It's suspected to be a hairline fracture." He added that his pillion rider suffered an injury to her lips due to impact when she hit the back of his helmet. Netizens have slammed the Jaguar driver's reckless driving especially considering how this is not the first time the man's actions have been caught on video. Previously, Stomp reported on the same Jaguar driver sideswiping another motorcyclist along Yio Chu Kang Road on Apr 9, causing damage to his bike's crash bar. "Overtaking me after the traffic junction and side swiping against my bike. The motorcyclist said the driver told him he would not compensate "a single cent" for the damage and blamed him for "swerving left to right". In a reply to the post on SG Road Vigilante, another rider said that he had encountered the same driver as well. He said that he was making a food delivery when the Jaguar driver hit his handlebar and sped off. Following the most recent incident, netizens are calling for the elderly Jaguar driver to be "banned" from driving.